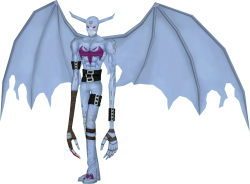 IceDevimon is a Fallen Angel Digimon who is the frozen and recolored counterpart of Devimon. He is a sadistic mass murderer, delighting in the pain he deals on others and relentlessly killing without mercy. Uses cold ice blade to strike the opponent.